ALMASI FLEET. James Mworia (second left), the Chairman of Almasi Beverages Limited and Joyce Macharia (left), the Company’s CEO and Mike Duder (right), the DT Dobie Sales Manager for Mercedes Benz Commercial Vehicles, flag off a fleet of ten Mercedes Actros trucks which will deliver Coca Cola products in the Rift Valley, Central and Western Kenya. Almasi Beverages Limited, a manufacturer and distributor of Coca Cola products, has taken delivery of ten Mercedes Actros trucks supplied by DT Dobie to boost the distribution of soft drinks to wholesalers in the Rift Valley, Central and Western Kenya. 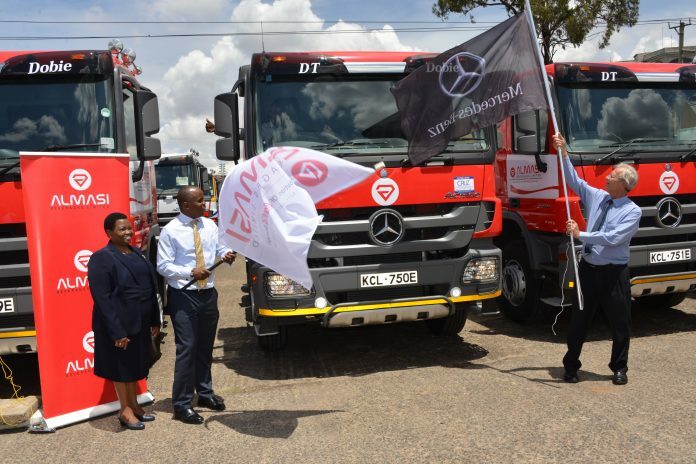 A team of executives and drivers from Almasi Beverages headed by James Mworia, chairman and Joyce Macharia, CEO, collected the fleet of trucks from Mike Duder, DT Dobie general sales manager for Mercedes Benz commercial vehicles and John Ngugi, a sales representative. Almasi Beverages Limited was incorporated in 2012 following the merger of three Coca-Cola franchise bottlers; Kisii Bottlers Limited in Kisii County, Mount Kenya Bottlers Limited in Nyeri County and Rift Valley Bottlers Limited in Uasin Gishu County. It is a subsidiary of Centum Investment Company Plc. James Mworia personally inspected the trucks and was briefed by John Ngugi about the fuel saving and safety features. He was also shown the security protection for the on board computers. Before the flagging off ceremony, Joe Mungai, DT Dobie driver trainer summarised the three-day course that had been completed by the Almasi Beverages drivers. This combined classroom work with question and answer sessions and driving the latest Mercedes Actros model. While on the road, the drivers mastered the use of the pace setting gearbox to minimise brake and tyre wear and reduce fuel consumption. The trucks delivered to Almasi Beverages were specially finished in the unique Coca Cola red colour by the Mercedes factory in Stuttgart in Germany. The prime movers allocated for work in the Rift Valley and Western Kenya are equipped with a 400 horse power engine. The trucks working in Central province have a 480 horse power engine to cope with high altitudes and hilly terrain.